If you are looking for a classic Texas Holdem poker game with high payouts; Ultimate Texas Hol’dem by Amaya Gaming will be a good choice. The game follows the rules of classic Texas Hol’dem poker, but adds amazing multiplier bets to each round. Let’s start with the graphics: it consist of a static image of a poker table. Fair enough – you don’t need anything else in this genre. The game contains a very detailed paytable too, we highly recommend checking it put before starting to play – just press on the “table limits” button at the upper left. As you can see from the paytable, the ante bet is 1.00 coin per round. You can bet maximum 100 coins in the demo version, but betting with 500 coins is possible in the real money version. Start the game by placing your wager to the “ante” section and click on the “deal” button. Both sides will get two cards, and five community cards will get dealt at the middle. Community cards are closed at this point, and you need to decide to continue the round or not. As you can see, if you decide to continue, you have two options: x3 and x4. Basically, you triple or quadruple your ante bet if you trust your current hand. If you press one of these buttons, all cards will be revealed and the side with the better hand wins the round. You can also press on the “check” button if your hand is not good enough: this opens only the first three of the community cards. Afterwards, you can still double your bet or keep clicking on the “check” button. Checking will open the last two of the community cards and this is the end of the round: you can fold or continue to play at this point. If you decide to continue, just click on the “x1” button and see the dealer’s hand. 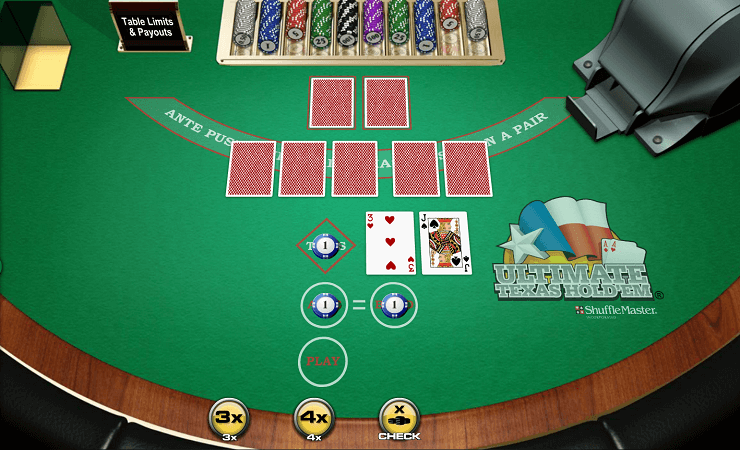 Ultimate Texas Hold’em is suitable for both practicing and casual gaming. But it really shines at its payout levels, you can easily win four times of your ante bet – this means 2.000 coins per round, if you are lucky enough. Try the free version first, but we highly recommend checking out the real money version too. Ultimate Texas Hold’em is a very well done game and comes with 500 complimentary coins for your enjoyment, this means hours of free entertainment!